Find real estate for sale in Cave Creek AZ and surrounding areas by selecting from our results below, or by entering your search criteria. Cave Creek is a somewhat small town located in the state of Arizona. 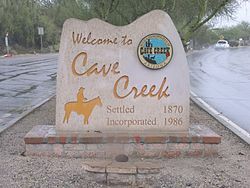 With a population of 5,622 people and two constituent neighborhoods, Cave Creek is the 74th largest community in Arizona. Cave Creek home prices are not only among the most expensive in Arizona, but Cave Creek real estate also consistently ranks among the most expensive in America. Cave Creek is a decidedly white-collar town, with fully 89.00% of the workforce employed in white-collar jobs, well above the national average. 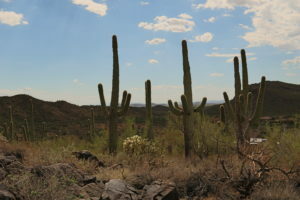 Overall, Cave Creek is a town of professionals, sales and office workers, and managers. There are especially a lot of people living in Cave Creek who work in management occupations (17.71%), sales jobs (13.63%), and office and administrative support (9.79%). Also of interest is that Cave Creek has more people living here who work in computers and math than 95% of the places in the US. One interesting thing about the economy is that relatively large numbers of people worked from their home: 13.03% of the workforce. While this number may seem small overall, as a fraction of the total workforce this is high compared to the rest of the county. These workers are often telecommuters who work in knowledge-based, white-collar professions. For example, Silicon Valley has large numbers of people who telecommute. Other at-home workers may be self-employed people who operate small businesses out of their homes. Residents will find that the town is relatively quiet. This is because it is not over-populated, and it has fewer college students, renters, and young children – all of whom can be noisy at times. So, if you’re looking for a relatively peaceful place to live, Cave Creek is worth considering. Do you have a 4-year college degree or graduate degree? If so, you may feel right at home in Cave Creek. 52.45% of adults here have a 4-year degree or graduate degree, whereas the national average for all cities and towns is just 21.84%. The per capita income in Cave Creek in 2010 was $55,732, which is wealthy relative to Arizona and the nation. This equates to an annual income of $222,928 for a family of four. However, Cave Creek contains both very wealthy and poor people as well. The people who call Cave Creek home describe themselves as belonging to a variety of racial and ethnic groups. The greatest number of Cave Creek residents report their race to be White, followed by Native American. Important ancestries of people in Cave Creek include German, English, Irish, Italian, and Swedish. The most common language spoken in Cave Creek is English. Other important languages spoken here include Spanish and German/Yiddish.